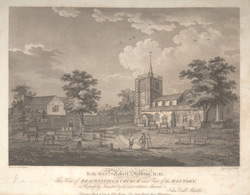 View of St Mary and All Saints Church in Beaconsfield in Buckinghamshire. It is situated at the Windsor end corner of the Old Town Crosswords. There was possibly an Anglo-Saxon Church on this site. The church building in this picture dates from around 1475. It has a distinctive squat steeple known as a 'Hertfordshire needle' which is surrounded by a wooden railing instead of a parapet. By the 18th century the church fabric was not in a good state and only small repairs were made. It was restored in the 1860s.